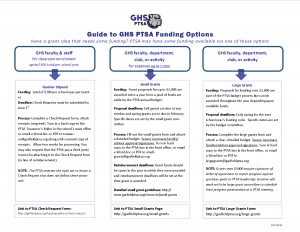 The Garfield PTSA invites GHS Staff and Clubs to apply for project funding through our Small Grant program. The deadline for Fall has been extended to Friday, OCTOBER 6, 2017 and the Spring deadline is Friday, February 9, 2018. A high proportion of grant proposals are funded, so please take the time to apply. If you have questions, please contact the chair: Lisa Horwich at horwich@gmail.com. This is just a small proportion of the initiatives the PTSA has funded through the generosity of our donors. FALL: Proposals are due (email or hard copy) by Friday, OCTOBER 6, 2017. We recommend that Fall grant funds be spent and requests for reimbursement turned in by Friday, January 27, 2018. SPRING: Proposals are due by Friday, February 9, 2018. All awarded monies must be spent and requests for reimbursement turned in by Friday, May 19, 2018. The committee will make every effort to contact you with their decisions approximately three weeks after the grants due date. Your application must be signed by a GHS staff person who is knowledgeable about the proposal. If you are GHS staff, you’ll need the signature of your department head or a designated faculty/staff member. Student proposals must be signed by a Faculty Advisor. Fill out the one-page form and attach a clearly detailed budget. Secure the necessary signatures of faculty/advisor approval. The faculty advisor may forward the request by email with their comments or sign the application. Turn in hard copy to the PTSA box in the front office, or send a Word doc or PDF via email to the address(es) below (preferably both). Seek to increase academic achievement or decrease disproportionality. Positively affect the greatest number of students. Have favorable impact on academic or vocational competence. Do not appear to have any alternative source of funding. Are the most cost-effective way of accomplishing the purpose. Sometimes we receive more requests than we have available funds. However, a high proportion of the proposals are funded, so please take the time to apply. We try our best to award these grants to assist our students, supporting your good ideas. 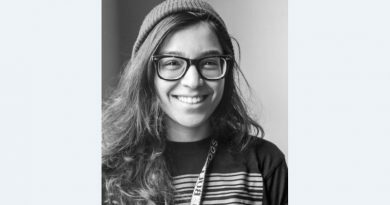 Thank you for all you do for Garfield.